I just got back from a week in the Eastern Sierras photographing mostly landscapes. I thought I would relay a little tip for composing scenic photos, for your next excursion. Eastern Sierras at June Lake, October. In this shot you can see that I was using a wide angle lens and I incorporated some rocks in the foreground. I always try to look for something to compose in the foreground so that those objects can lead the viewer into the frame. 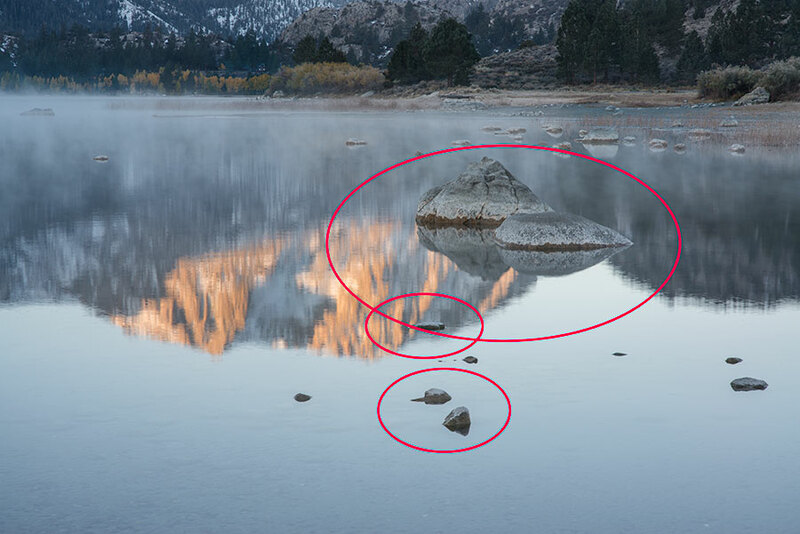 While the mountains with the sunrise skimming across the top are the main focus of the image, the rocks add some texture to an otherwise mundane lake view. Composing the foreground with the reflections. While I was setting up, and freezing because of not being prepared for 20 degree weather, I had a passer-by shoot the photo of me setting up. Often when I'm setting up, other photographers will stop and ask me what I'm doing, what kind of lens or camera that I prefer. This was do different, as a women walked by with a camera slung around her neck, asking questions. After a few pleasantries, I asked her to take my photo with one of my other cameras. She said, sure! Almost flattered that I would ask. It took me a minute or two to take my long lens off my other camera and the woman watched me with great interest. When I handed her my camera and went to crouch down by my tripod, she became very curt, saying "Be quick about it! I have things to do. Quickly now." What is that about? She had all the time in the world when she was asking questions, but when it came to taking a quick shot for me, she became demanding. This is a round about way for me to explain why the photo by me is slightly blurry, it wasn't shot by me. Even in the panorama of the same scene, I chose to keep something in the foreground to provide some interest and to break up the reflections on the water. Even in this panorama, I try to include something like rocks to breakup the reflections and add some interest to the water.